Khensur Denma Locho Rinpoche ceased breathing and entered into clear light meditation on Thursday, October 23, at his home in McLeod Ganj, India, after a brief illness. He was 86 years old. Denma Locho Rinpoche was a highly respected Tibetan Buddhist master and one of Lama Zopa Rinpoche’s gurus. 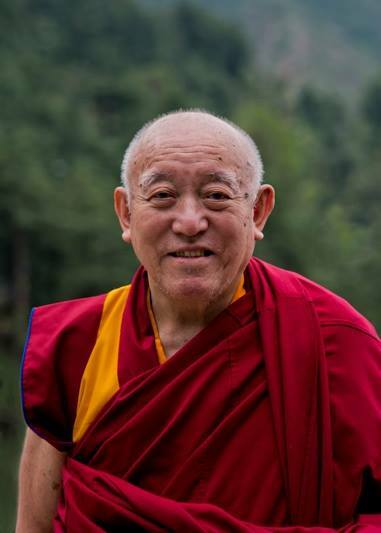 Denma Locho Rinpoche was also an incredibly powerful and important teacher to many FPMT students and to many monks and nuns at Kopan Monastery. He taught at several FPMT centers and led the Kopan Monlam for many years. He was regarded as an expert on Manjushri’s fierce form, Yamantaka, and on several other teachings and practices. Denma Locho Rinpoche was born in Kham in eastern Tibet in 1928 and was recognized at the age of six as the reincarnation of a famous yogi, Choying Gyatso, from the local Selkar monastery. At age eleven, he entered Drepung Loseling Monastic College near Lhasa. He obtained his lharampa geshe degree at age 25 and completed his tantric exams at Gyume Tantric College in 1958. He received many teachings from the late Kyabje Ling Rinpoche (the senior tutor to His Holiness the Dalai Lama) and became the main lineage holder of all his teachings. Denma Locho Rinpoche fled Tibet in 1959 for India, living in Sarnath for two years and then spending two years on a research fellowship at Calcutta University. He then became the principal of the Buddhist School of Dialectics in Ladakh. In 1967, he become abbot of a small monastery in Manali. He served as abbot of His Holiness the Dalai Lama’s Namgyal Monastery from 1986 to 1991 in Dharamsala, and visited the United States on several occasions, including one year teaching at the University of Virginia. After hearing of Denma Locho Rinpoche’s passing on Thursday, Lama Zopa Rinpoche led a six-hour Lama Chopa and tsog, until 2:30 a.m., at Thubten Shedrup Ling Monastery in Bendigo, Australia, with Sangha and some lay students. Lama Zopa Rinpoche spoke extensively about Denma Locho Rinpoche’s tremendous kindness. Denma Locho Rinpoche had great concern for Lama Zopa Rinpoche, FPMT and the Maitreya projects. Many times he was consulted in regards to pujas or practices to overcome obstacles. He also often gave advice on what students could do for Rinpoche’s health and long life. Just before starting the recent month-long retreat in Australia, Ven. Roger Kunsang consulted Denma Locho Rinpoche about pujas that needed to be done to overcome obstacles. FPMT is deeply saddened by the loss of such a generous and profound teacher as Denma Locho Rinpoche.